One of our best friends visited us this week. Like us, he loves sweety treats so I decided to go for some cookies. Below is the recipe I followed. Preheat the oven at180° C.
In a bowl, mix butter and sugar. Whip well to get a creamy mixture. Then add the egg and after the flour, the baking powder and the chocolate chips. Don’t stir too much the mixture. On a baking sheet, drop by heaped teaspoons or tablespoon if you want to have big cookies. Bake 8 minutes. When they are done, let them cool for a minute on the baking tray, then cool on a rack. Don’t bake them too much otherwise the cookies will be dry! As always it takes time to make cookies and you only need one minute to eat them. My friend was so addicted to my cookies that I had to hide the box to save some for my lunch at work! However, I was happy to see that my recipe was a success. 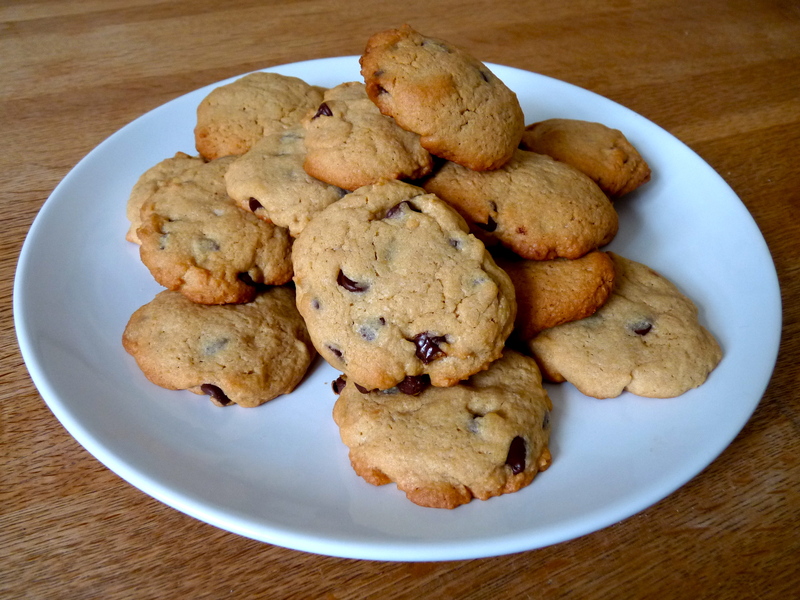 This entry was posted in Cookies, Recipes and tagged chocolate cookies, cookies by thebloodyfrog. Bookmark the permalink.